Back in February, I got unreasonably excited about a dart gun: the BOOMco Spinsanity 3X. Firing 30 rounds of flying rubber up to 70 feet away, it looked like it could beat Nerf at its own game. 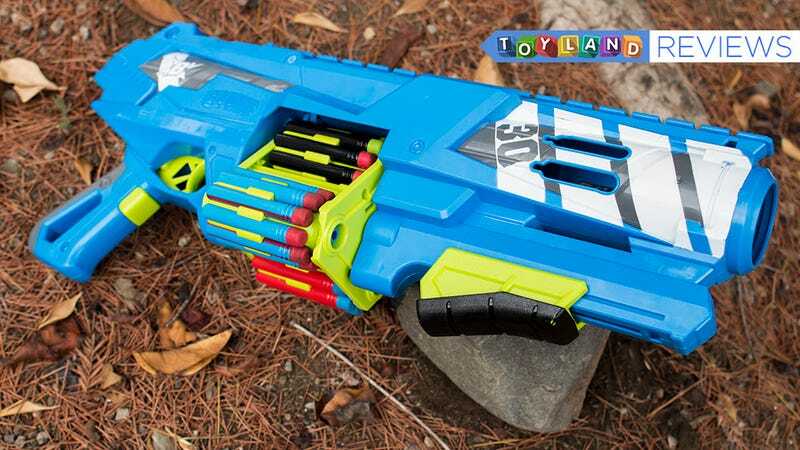 You see, BOOMco has amazing darts that fly incredibly straight and magically stick to specially treated surfaces, but they haven’t had a great, vaguely affordable rapid-fire blaster to carry into battle. None have had quite enough range or rate-of-fire to compete with Nerf. Yet Nerf’s rapid-fire blasters are typically hard to reload. Usually, you can’t just stoop down, pick up darts, and feed them into the blaster. The $40 Spinsanity 3X looked like the best of both worlds. Today, it’s here. I’ve got two. I used them in a real nerf war. I hated nearly every moment of it. Because BOOMco’s Smart Stick Darts are so small, the Spinsanity 3X really does carry 30 of them at a time, in these awesome spinning cartridges that you can load on the go. 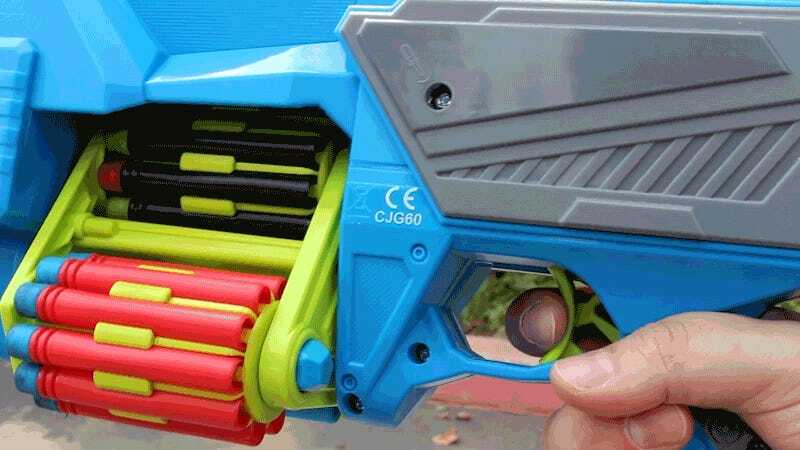 They pop right into the blaster on two spring-loaded pegs, so you could even carry some extras for ultra-quick reloads if BOOMco ever decides to sell them separately. While the front peg of each cylinder is round, the rear is a pentagonal prism that acts like a gear—so every time you pull the trigger, it’ll rotate the cylinder to the next dart’s position. 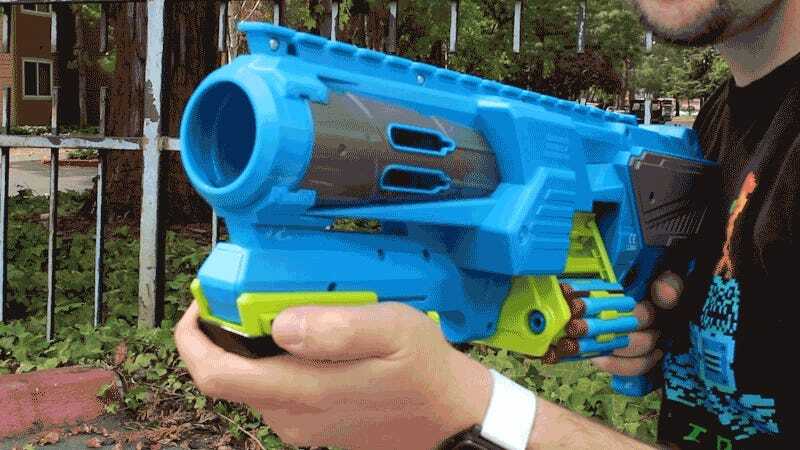 The trigger is connected to a little arm that pushes each dart into a pair of motorized flywheels, which spit out the darts at ranges that are on par with most stock Nerf blasters. To operate, you insert 6 AA batteries, hold down the acceleration trigger beneath the main trigger to spin up the flywheels, then fire off some darts. Once you’ve fired your first ten shots, you just pull back on the charging handle to load the next ten. And so on. The Spinsanity is ridiculously finnicky about every single part of its operation. Screw up one little thing in the heat of battle, and you’ll have a jammed blaster and/or some darts lying on the ground. Make sure every single dart is underneath the little locking tabs in the cylinder. Push every single dart all the way back in the cylinder. Pull the trigger all the way back (it’s a LONG pull) for every single shot. If you’re lucky, another half-pull will simply cycle to the next point on the cylinder and a dart will fire. Or maybe a dart will have already jammed. And you won’t know which. When you feel the trigger stop short, you won’t know whether you should 1.) quickly pull back on the charging handle to move to the entire next set of 10 shots (which has the nice side effect of clearing the jam), or 2.) pull the trigger again and maybe get things jammed worse. Either way, it feels like you’re breaking the blaster when this happens. It makes me sad. And you shouldn’t buy one of these until or unless Mattel and BOOMco fixes it. I mean, if you have the power of will to fire and reload slowly and extremely methodically, you can definitely get off all 30 shots. I’ve done it. It definitely works. But it’s such a hassle. By the way: see my first animated GIF, the one where I’m pumping the charging handle? It turns out I’m holding it wrong. Since the charging handle locks in place in both the forward and rear positions, many blaster fans assumed you could use it like a foregrip in whichever position is comfortable. But in the forward position, the three cylinders aren’t actually locked in place, and you can easily knock them out of alignment when you’re trying to reload your ammo. That’s not really a ding, it’s just emblematic of how finicky the Spinsanity is. You’ve gotta use it exactly the right way, which is a pretty tall order even for adults—not to mention kids. And I’m bummed, because I really want BOOMco to succeed. Their darts are awesome, their designs are awesome, and I’d love for Nerf to have some meaningful competition. Thankfully, this isn’t the only new BOOMco product on the market. The $80 Colossal Blitz is a seriously amazing blaster.